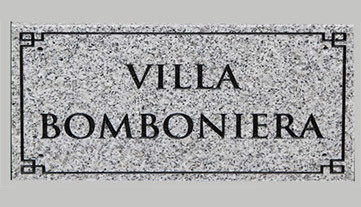 These marbles and granite home name plates are beautiful and long lasting. The granite, marble and quartzite is all polished apart from the white carerra marble which is honed smooth but not polished. The prices shown above include the first 6 letters. The cost after the first 6 letters is £1.10 per letter. 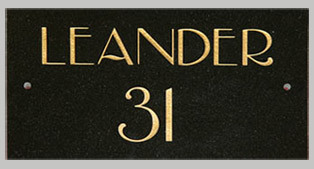 We have 15 different stones - shown below - for home signs. As well as granite and marble there is quartzite which is tough, scratch resistant and sparkles in the sunlight. The blue is very popular. Lettering is usually painted Silver, Gold, White, Black or Ivory - other colours are purple, crimson, blue - light, dark and pearlescent, green - lime, dark and pearlescent. We can also blast away the background leaving the lettering raised and unpainted. Holes can be drilled if required @ £1.10 per hole We also have various adhesives available or you may prefer to purchase your own from a builders merchant. There are many available these days. 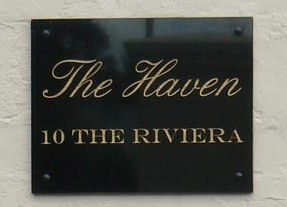 The thicker granite is normally used for larger properties wanting a large granite sign. We can cut the granite to any size. The 20mm granite comes to us in slabs 310mm by 1500mm - we cut it to the size you require. 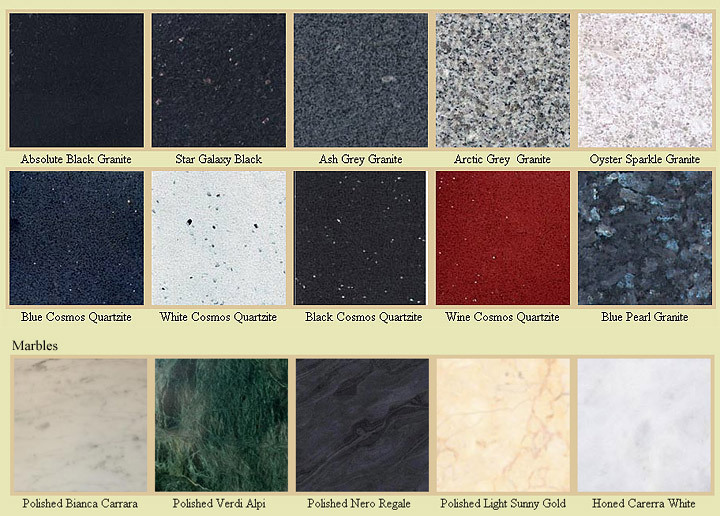 The edges can be clean cut, honed smooth or polished.The colours available are shown below but please note there is an additional 20% cost on blue pearl or black pearl. We also have 30mm thick granite available for even larger signs - email for a quote.